City Council had a short agenda for the Feb 25, 2019 meeting. The only things they really had to decide on were whether or not to grant Temporary Use permits to retail Cannabis outlets and whether the development at the north end of Boundary Drive would get a permit or not or would council listen to the neighbours who don’t want it. Along with the things on the agenda were a pair of motions to lobby higher levels of government on behalf of the businesses in town. The ones whose results from dealings with the provincial government and insurance companies have been, shall we say, less than fruitful. Maybe shabby would be more appropriate. The Disaster Financial Assistance And Emergency Program Act. Whereas many small business owners in British Columbia have many different household income sources and whereas small business form a critical part of rural communities because of the employment taxes and services they provide therefore let it be resolved that the province change the emergency program act and the disaster financial assistance program to better address the needs of rural British Columbia small business owners. Whereas many property owners and small businesses were recently affected by floods and fires across British Columbia and whereas many of those property owners and small businesses were unable to get insurance coverage, were unable to access that coverage in a timely manner or were denied insurance coverage from their insurance provider therefore be it resolved that the Ministry of Finance review insurance practices in British Columbia. To identify ways to better serve property owners with small businesses affected by disaster. They’re talking both flood and fire. On a sober note council has essentially put consumers of medical cannabis in the position of possibly having to resort to the black market. When faced with the decision to offer Temporary Use Permits to Medical Cannabis shops council voted No. And No to the same for Recreational Use shops as well. Warning – Rampant Editorializing ahead. Picture your ailing grand parents visiting the same dealer you or your friends do. On the down low with an eye out for the cops . . all because even though the federal government has played with medical cannabis for years. and NOW recreational cannabis is LEGAL technically medical cannabis shops are not legal. For now. So you might potentially be faced with this situation: If you want to help your parent / grand-parent to keep their food down ‘cuz their medical treatments are murder on their digestive system and they can’t get the stuff that let’s them keep their food down . . . you might be forced to share your stash with them. But what if they also have asthma or COPD and smoking is not an alternative? What then? Does your dealer (we have no pot shops here yet) have tinctures, drops, edibles, CBDs . . . ? Does your doctor give referrals to dealers? They do to medical cannabis dispensaries. Whether or not this situation comes to pass now has more to do with how much spine the medical cannabis shop has and how much scrooge the system is willing to be. Sad. 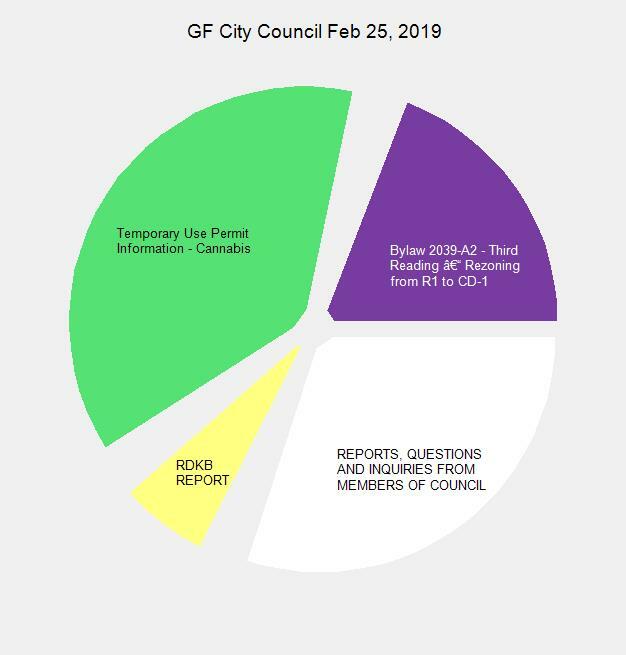 This entry was posted in City, government and tagged Bylaw 2039-A2, cannabis, DFA on February 28, 2019 by gftvboss. On August 22 there was another Boundary Flood Recovery Update meeting at GFSS in Grand Forks. The audience grew to over 110 people. The number seated on stage had shrunk to 4 (previous meetings had as many as 8). The organization this time was a timeline review of June and July followed by about 20 submitted questions and then the questioning was opened up to the floor. This entry was posted in flooding and tagged berm, bfre, DFA, dike, flood, recovery, red cross on August 24, 2018 by gftvboss. With the recent flooding disaster in Grand Forks many are getting what they think is the worst possible news: Their Insurance won’t cover them for flood. It could get worse for them because they might not qualify for Disaster Financial Assistance either. This is from an insurance change in the ‘recent past’. At one point no overland Flood Insurance was offered in Canada so almost everyone was DFA qualified. But a few years ago the industry began offering it and that pushed people into a bind. We will be looking into this further to determine the particulars of this. Specifically are Insurance Brokers obligated to tell you that if you turn down the Flood Insurance they offer and you do suffer a flood, such as we have, you will not get DFA and likely lose everything? Did the Insurance Industry look upon this as a profit centre knowing that their insurance and deductible would be extremely expensive but pretty much mandatory for people like us in Grand Forks where a large part of the town is in a flood plain? Stay tuned as we find out more. If you would like to know about how this kind of problem has evolved south of is in the USA please watch the PBS Frontline documentary The Business of Disaster. It may be about the USA but it’s an eye opening education on floods, insurance and governments. This entry was posted in Editorial, flooding and tagged DFA, flood2018, insurance on May 24, 2018 by gftvboss.